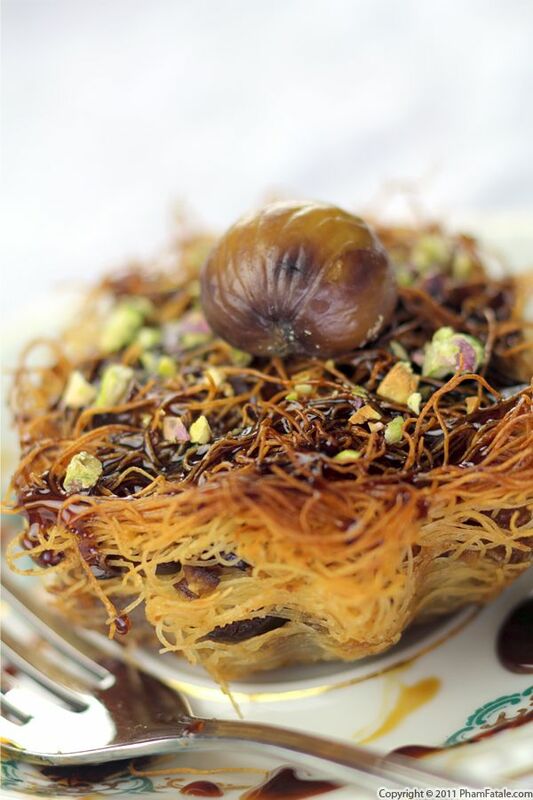 Have you ever had trouble serving baklava? It gets sticky, messy and difficult to handle. I found a solution by using shredded phyllo dough instead of sheets of phyllo dough and baking it in individual molds. They tend to trap the syrupy goodness in their web instead of getting soaked and sticky. Since it's the holidays, I wanted to add the flavor of Christmas to the baklava, so I added chestnuts. I layered both chestnut purée and roasted chestnuts into the baklava, along with crushed pistachios for color and flavor. I also substituted date syrup for honey, which added a depth of flavor and a strong contrast of color. If you're looking for a dessert recipe for the holidays that's easy to make but looks elegant, consider baklava. It's an easy, stress-free dessert that is sure to please everyone. 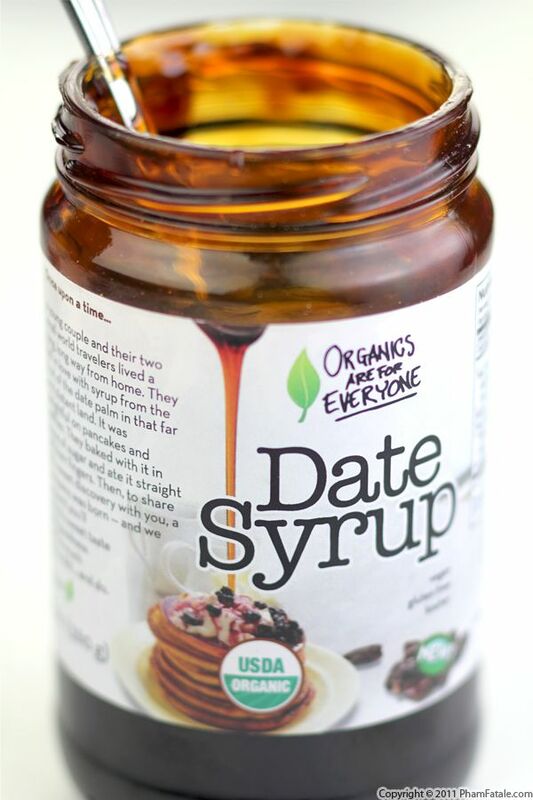 I used pure, organic date syrup from Organics Are For Everyone. If you've never tried date syrup before, you're in for a treat. You can use it in place of just about any syrup. 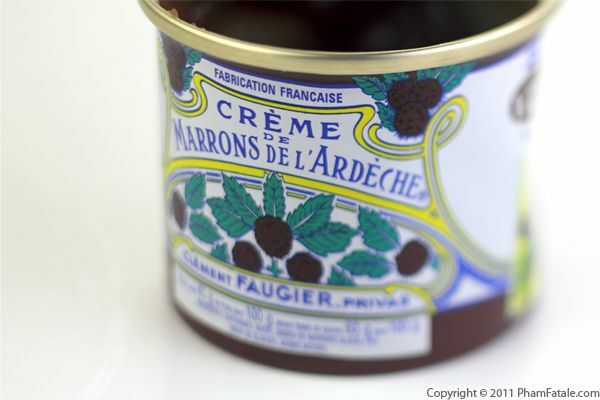 Date syrup has a mild tanginess to it that balances the sweetness. I especially like it on waffles, pancakes and French toast. For a chance to win two jars of date syrup from Organics Are For Everyone, enter today's 25 Days of Giveaways contest. And if you're interested in making this recipe today, you can get a 20% discount from Organics Are For Everyone by using the "FATALE" promo code (good till 12/21). Make sure you're a fan of PhamFatale Facebook fan page and Organics Are For Everyone, or follow @Phamfatalecom and tweet about this giveaway. To make it easy, you can just copy and paste this tweet if you’d like: "2 jars of Organics Are For Everyone pure date syrup #Giveaway from @Phamfatalecom and @DateSyrupRocks: http://bit.ly/sp4V7y"
Place the melted butter in a spray bottle. Place the bottle in bowl filled with hot water so the butter remains melted. Reserve 2 tablespoons crushed pistachios for garnish. In a bowl, combine the remaining pistachios, vanilla sugar and light brown sugar. Spray individual non-stick tins with the melted butter. 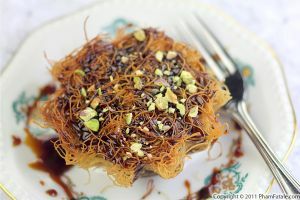 Create a nest with one level of shredded phyllo dough. Sprinkle with a little of the pistachio mixture. Spray with a generous layer of melted butter. Spoon little mounds of chestnut spread and top with crumbled roasted chestnuts. Spray more melted butter. Add another layer of shredded phyloo dough. Repeat until you have 2 separate layers of pistachio mixture. Make sure to spray butter between each layer of shredded phyllo dough. Finish with a nest of shredded phyllo dough and a sprinkle of the pistachio mixture. Spray melted butter on top. Bake for 5 minutes at 375°F, then lower the heat to 350°F and bake 15 to 20 minutes until slightly golden. Unmold the baklava and drizzle with date syrup while it's still hot to moisten the dessert. Let sit for at least 1 hour. 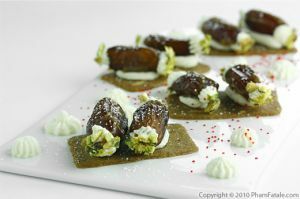 Garnish with pistachios and halved roasted chestnuts. 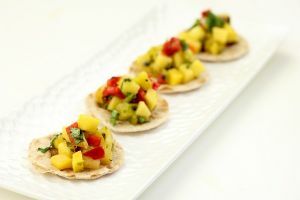 Serve with a cup of masala chai. How to make vanilla sugar: After scraping the grains from a vanilla bean, don't discard the remaining vanilla bean. Just place it in a jar and cover it with regular granulated sugar. Let it sit for a few weeks and you'll get a nice, fragrant vanilla sugar. I buy ready-made peeled, roasted chestnuts at a local Asian market. They're sold in 10.5-ounce (5-small bag) packages. Chesnuts are slightly sweet, nutty and starchy. When working with shredded phyllo dough, I cover the dough with a dampened cheese cloth to maintain the same level of moisture. I buy it at a local Middle Eatern store called the Rose Market in Mountain View, CA. 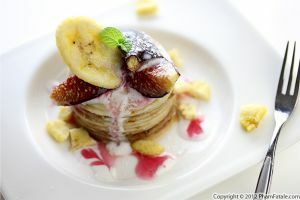 To repeat the flavors from the date syrup, you could add chopped dates to the filling. One of our local markets carries chestnut purée but you can also find it online. 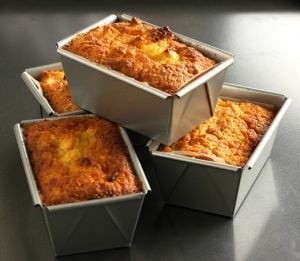 I use non-stick individual tins for easy unmolding and serving. If you like, you could flavor the filling with rose water, orange blossom water or fresh orange peels. 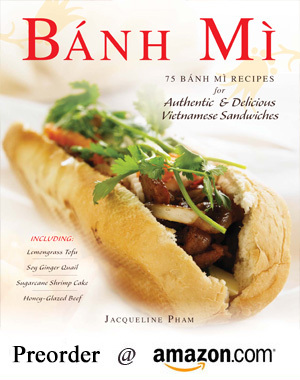 Published By: Jacqueline Pham on December 16, 2011.